With their reduced size and better turning circles, Compact Tractors are perfect for larger gardens and smallholdings. They're incredibly versatile, with a range of auto-connecting attachments available that allow them to be used for a whole range of tasks including lawn cutting, lifting and loading, tilling, and log splitting. Compact Tractors bring flexibility and controllability - easy handling precision tasks like aeration and spraying. 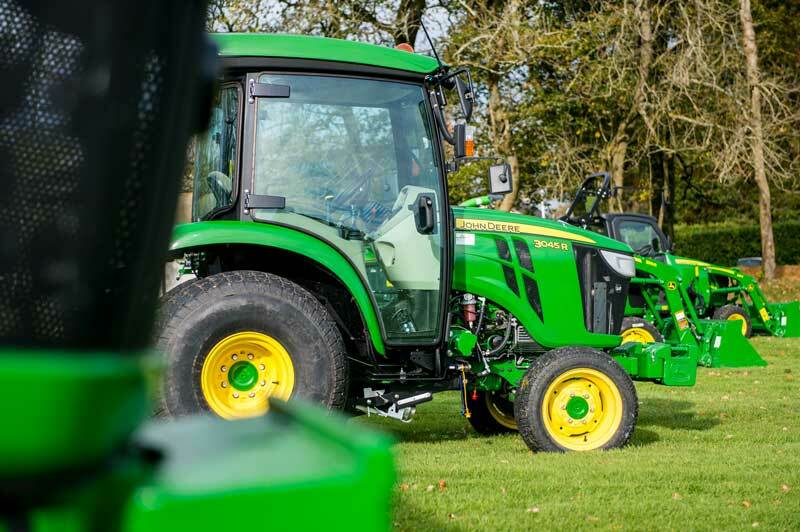 Quiet and comfortable, the large range means there's a Compact Tractor that's just right for you - and each model can be customised to suit you perfectly with a range of accessories - from weatherproof cabs, to a choice of tyres to suit your driving surfaces. We only sell what we think to be the best...and so only sell John Deere Compact Tractors. We believe their quality, reliability and performance puts them head and shoulders above the marketplace. Our Compact Tractors, like all the machinery we sell, are backed up with a sophisticated servicing workshop, highly trained technicians and a full parts and spares service. So you can be sure your tractor will be well cared for and in good working order for years to come. We've got a massive range of new and used Compact Tractors at Powercut. Pop by and see them for yourself, or you can browse through our collection of equipment online.